The women’s volleyball team lost 3-2 to Wheaton College on Tuesday night after five close sets. 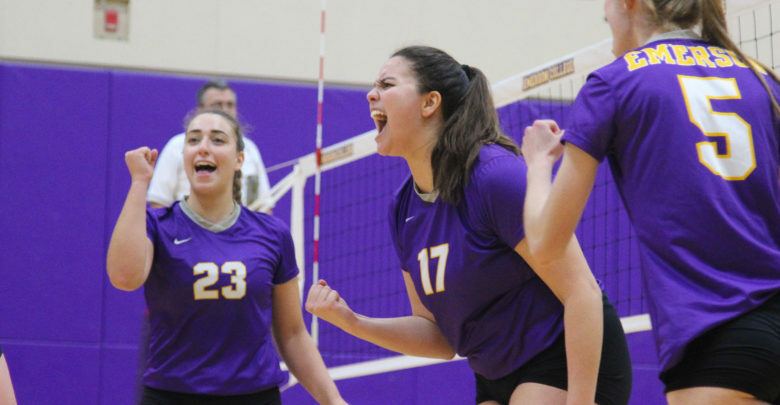 While Wheaton won the first set 26-24, Emerson rallied to win both the second 25-20 and the third 25-19. The Wheaton Lyons triumphed in the fourth set 25-23 before closing out the match with a 15-13 victory following a highly contested fifth set that saw three ties and Emerson briefly in the lead 11-9. Sophomore Grace Tepper led the way for Emerson with 14 kills, 10 digs, and five service aces. Senior Fara Cohen scored 12 kills and 20 digs and sophomore Albany Alexander contributed 14 kills and a .480 kill percentage. Head coach Ben Read said he liked what he saw from his team, especially from his pin hitters, who contributed big kills to the game. Wheaton outscored Emerson 83-75 in points and 72-55 in kills. Freshman Adara Hamilton finished with a game-high 25 kills for the Lyons. Read said his team could improve by focusing on small details of the game. Women’s volleyball is now 1-6 in the New England Women’s and Men’s Athletic Conference and 9-9 overall. The Lions will take on Wentworth Institute of Technology in a non-conference matchup at home on Friday, Oct. 5 at 6 p.m.